Its easy to illustrate the problem that is caused by just installing shorter springs while leaving the stock shocks to fend for themselves. This video was taken just after the stock shocks were removed. They survived for only six months after spring installation before degrading to this virtually useless level. With shocks like this, your suspension is relying mostly on your springs. Originally, when there was almost nothing available in the early days of the LX platform, I installed an Eibach Pro-kit spring set, which advertised a 1.3" drop. The manufacturer's reported drop, however, was widely found to be inaccurate and mine soon settled to 1.75'' down from stock, which is typical. The first thing my dealership's service manager told me was that a drop like that would ruin the shocks, which were not made for such a reduction in travel. It turned out he was right. As an early adopter I was one of the first to experience the problem. Many followed soon after: The shocks became worthless and you wound up riding - bouncing - on springs alone. The more aggressive your style of driving, the more quickly the shocks degrade. Net Effect: Significantly improved cornering thanks to lower center of gravity. Reduced body roll thanks to less capacity to travel and slighly stiffer spring. Initially very few detrimental ride effects, until their use destroys the shock thanks to reduced travel and bottoming out the shock due to their very nature. The solution to the spring problem, when it became available on the market - and what arguably remains the best-all-around solution - came from KW Suspensions in the form of a Variant 2 coilover kit. The non-adjustable Variant 1 is also available for the LX platform and is a good lower-cost solution. In fact the V1 is private-labeled and sold by Mopar as their Mopar Performance coilover (it even still has the KW labels). 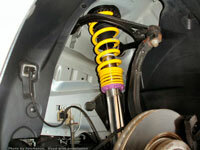 The Variant 1, manufactured by KW, is used as the basis for Eibach and STI's coilover products as well. The Variant 2 differs from the Variant 1 in that the V2 is adjustable for damping. Both versions allow for vehicle height adjustment. Its worth noting that the purpose of 'dropping' the car in the first place was not for aesthetics, but to lower the vehicle's center of gravity to improve cornering. The KW's variable height adjustment allowed me to tailor the precise amount of lowering. In my case I decided upon a drop of two inches in the front and 2.5 inches in the rear (in theory, this is more than the rear can be lowered but the capacity is there). The increased lowering in the rear brought the rocker panels closer to level, and improved cornering performance under heavy braking. Net Effect: A major step in the transformation of the vehicle's handling capabilities. 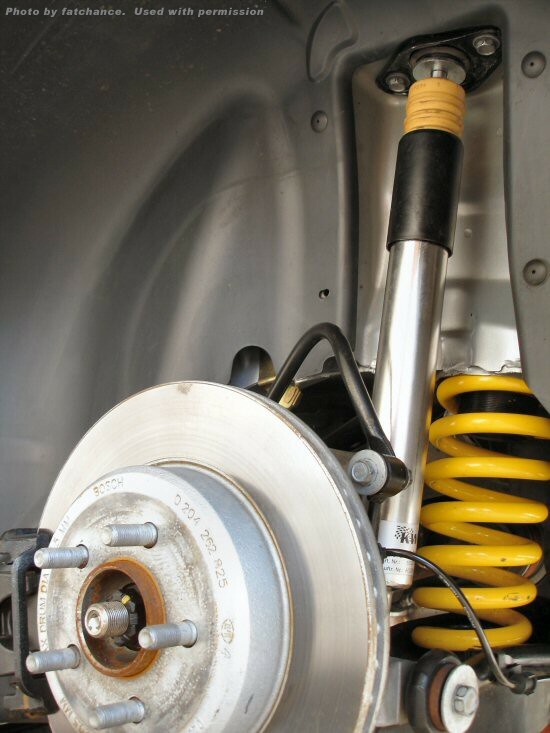 The advantage of a lower center of gravity is combined with a proper sport shock/spring combination. Dialing dampening down to its firmest level still results in a reasonably comfortable yet sporty ride that approaches acceptable 'trackability'. 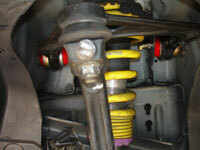 What are often simply called ''sway bars'' are a common performance handling improvement. 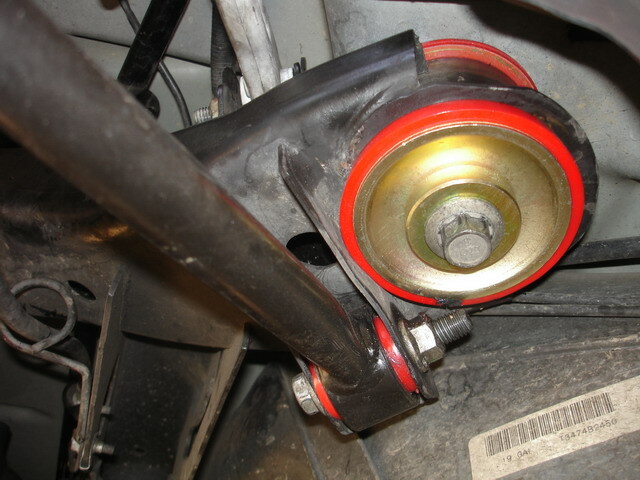 Sway bars essentially connect the right and left wheels via a metal (typically steel) bar/torsion spring that increases the suspension's ability to resist body roll during cornering. Most autos come stock with sway bars already installed, but typically those bars are not optimized for high performance. While a number of sway bars are now on the market, only one manufacturer - Hotchkis - has ever published its stiffness over stock (30% in front, 150% in the rear). They were also among the first in the market and enjoy a highly favorable reputation among their LX customers. I replaced the factory stock sway bars with the Hotchkis product and the results were nothing short of dramatic. For the performance-minded driver this component is a must. Net Effect: Significant, noticeable decrease in body roll and improvement in cornering. Whereas formerly the car is able to soak up road shock one wheel at a time, the more stiffly-connected corners now respond to uneven road surfaces more as a single unit. Think of a brick with wheels attached to it. Like that. Ride comfort is thus degraded, but if a sports suspension is your goal this is essential in achieving your goal. Your typical vehicle is equipped with rubber bushings. Bushings are essentially great big rubber washers or shock absorbers that are used as connecting or mounting pieces between moving under-car parts. Particularly those that are suspension-related. The rubber that is typically used, while very stiff, is under tremendous stress and as such is - relatively - very pliable. What is needed is something that retains some flexibility, remains durable over time but is far stiffer than rubber. The answer for a variety of motorsport applications is to replace the rubber components with one formulation or another of plastic or urethane. Net Effect: While expensive relative to what 'poly' bushings often cost on other platforms, The system offered by Pedders - currently the only one available on the market - performs. Most immediately noticeable is the time lag associated with steering input and weight transfer has effectively disappeared. The car now goes immediately where it is pointed. 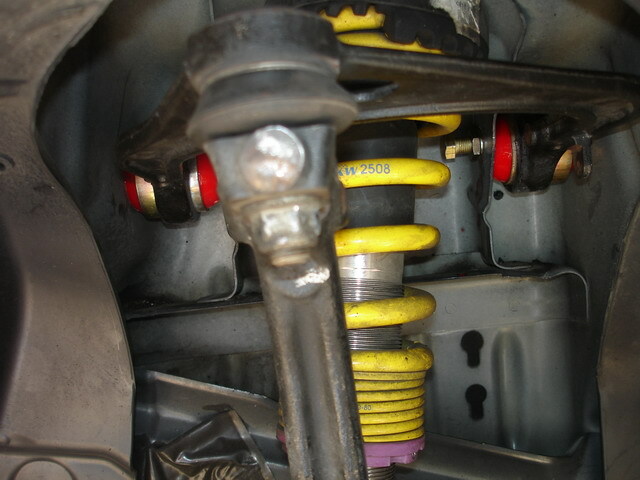 This is the finishing touch to a suspension that started out a family truckster and ended up a track demon. There is, however, no free lunch in this world. With improved handling comes decreased ride comfort. The Pedders product does not suffer from the increased noise that most poly bushing kits inflict upon their owners, but stiffer bushings equal a stiffer ride. Particularly when driving over the slab seams often found on urban highways. You'll definitely notice an increased thump to the tuckus.